VOB, full name called Video Object in DVD specifications, is a popular format, also a video container including video, audio and subtitles together. It is considered as the standard format used for making a DVD file. However, VOB files currently cannot be supported by Apple devices. That means if you are an Apple user, you are not able to enjoy DVD files on your iPhone unless you do a format conversion. To solve that problem, MOV is a file format highly advocated for it is the defaulted format for QuickTime and runs on any Apple devices perfectly. Just check the following text and you will find several tools to use. How to convert VOB to MOV without difficulty? To begin with, a free usable online application is Video Grabber. It supports conversion among different kinds of audio and video formats including VOB and MOV as well. Without troublesome registration and file size limits, users are totally free to do the conversion. Moreover, one can add multiple files at one time and do the conversion together. Here are the steps upon how to make a VOB to MOV conversion. Step 1: Go to Video Grabber webpage and find the “Convert Video” tab. Step 2: Click on the “Browse” button to import the VOB file. Step 3: Choose “MOV” as the output format. Configure the parameter settings like “resolution”, “bitrate” and “frame rate” as you need. Step 4: Press on the “Convert” button to start the process. After completion, the file will be placed in your Mac automatically. This online application allows you to convert VOB to MOV quite easy. By the way, if the network status is not steady, a third party program is for advice. Video Converter Studio is a more professional program together with powerful functions satisfying demand of people to the most extent. It not merely has fast conversion speed but also keeps quality of origin files perfectly. Almost all kinds of audio and video formats are available. Aside from that, one can choose the output file according to his portable devices, even 4k included as well. Here are instructions for how it works. Step 1: Download this program in your Mac and then launch it after that. Step 2: Glance through the user-interface, click on “Add Files” button to upload the VOB file. 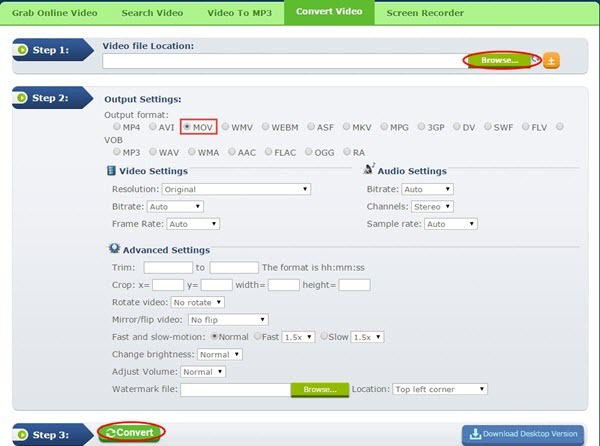 Step 3: Open the “Profile” drop-down list, choose “Video” > “MOV” as the output format. Step 4: Press the “Convert” button to begin with the conversion. Beyond a VOB to MOV converter, it can also serve as a video editor and downloader. When it comes to editing function, you can trim the video by clicking “Add Trim Marker” button and drag the sliders to select the part of the video as you want. You can also choose to crop the file and add image, text and subtitle to your video. As for the download part, it can download video or audio files from many video hosting websites and play them immediately with the help of a built-in media player. Zamzar is also a web-based tool capable for a VOB to MOV conversion. It is a program generated from an incorporated company in England, which can convert multiple file types including images, videos, audios and documents. It also supports URL converter, which means one can convert files from website after entering the URL. However, the file sized is limited up to 100 MB so that it is not suitable for large files and batch conversion. Additionally, users have to offer the email address to receive the converted files. Just follow the steps below and you will know how to use it. Step 1: Go to its webpage and then click the “Choose File” to upload the VOB file. Step 2: Click the “Convert the file to” drop-down list and find “video formats”, and then select “MOV” as the output format. Step 3: Enter the email address in the blank to receive converted files. Step 4: Press the “Convert” button to start conversion, and once done, check your email to find the MOV file. Probably, the most cumbersome thing is that one cannot get the converted files immediately but receive the file from the staff and then download it to the PC, which will make the conversion process a little time-consuming. And leaving the e-mail address may not be good for video security. All these mentioned above are accessible ways for you to convert VOB to MOV with ease. 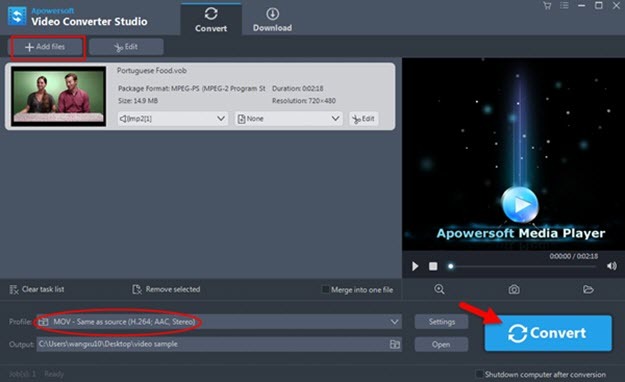 For users who want to enjoy the quality as well as the original video, Apowersoft Video Converter Studio is a wise choice. For people who pay more attention to a free and convenient application, Video Grabber is worth a recommendation. If your file size is not very large, Zamzar can be a good free helper. All in all, make a complete comparison and one can find a most suitable way.